Groups: The Clays and also The Montmorillonite/Smectite Group. Sometimes placed with the Mica Group. Uses: As a toxic spill cleaner, a fire resistant material, soil additive and other industrial uses. Vermiculite is an important member of the Montmorillonite/Smectite Group, members of which also belong to the larger general group known as the Clays. Vermiculite is also sometimes placed in the Mica Group, although recent analysis has excluded it from this group. Vermiculite is basically overly hydrated biotite or phlogopite. 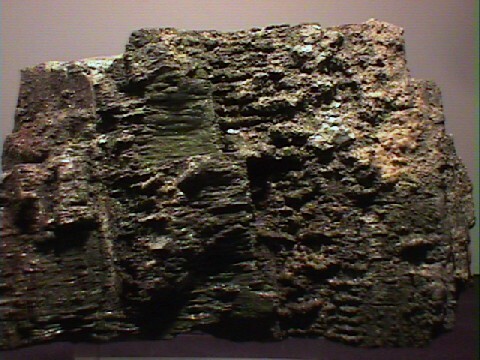 Natural specimens originated as these minerals and later altered to vermiculite through weathering or hydrothermal processes. Vermiculite typically forms small platy mica like crystals. These crystals contain water in their structures and when heated to above 870° C, the water turns into steam causing the crystals to expand rapidly. The volume increase can be 2000 to even 3000%. The resulting material is then very useful for many industrial purposes. It is very lightweight, chemically non-reactive, fire resistant and odorless. Vermiculite can be used to soak up such toxic liquids as fertilizers, herbicides and insecticides. It is this ability that is also being put to good use as a bedding for pets and livestock. In addition, vermiculite can be used in concrete and ceramics as a heat resistant additive. Color is usually brown to golden brown, also white, colorless or yellow. Luster is pearly to greasy. Crystal Habits include pseudohexagonal tabular crystals or "books", also found in compact or lamellar masses or microscopic crystals. Cleavage is perfect in one direction, basal. Fracture is uneven to lamellar. Hardness is 1.5 (can sometimes leave marks on paper). Specific Gravity is 2.3 (below average). Other Characteristics: crystals expand to many times their original volume when heated. Associated Minerals include corundum, apatite, serpentine, talc, stellerite, biotite, chlorite and other clay minerals. Notable Occurrences include the type locality of Milbury, Worcester County, Massachusetts, USA as well as the Rutherford quarry, Henderson County, North Carolina; Brinton's quarry, Chester County, Pennsylvania; Magnet Cove, Hot Spring County, Arkansas; California and Libby, Lincoln County, Montana, USA; Ajmer, Rajasthan, India; Phalaborwa, Transvaal, South Africa. Mud Tank, Valley Bore, Northern Territory and at Bulong, Western Australia, Australia; the Potaninskoye deposit, Southern Ural Mountains and the Kovdor massif, Kola Peninsula, Russia. Other industrial sources are in China, Brazil; Sweden; Canada and Zimbabwe. Best Field Indicators are softness, color, luster and expandability when heated.